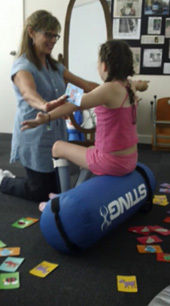 This Paediatric Therapy & Workshops initiative offers individual, intensive NDT treatment to address the functional goals of families & children with cerebral palsy. Dr Kate Bain, an NDTA™ (USA) certified paediatric therapist, is available to treat children at home or at a venue of the the family's choice. Performance of the family-selected functional goal will be recorded before and after treatment. Functional ‘Carryover’ opportunities for home, school, preschool etc will be addressed with families. We provide the opportunity for children to receive intensive treatment within their own home Australia-wide. Download the flier for further information and contact us if you would like to book into this intensive option. The treating therapist is a registered Better Start and NDIS provider and has a current HIC provider number (i.e. treatment may be qualify for a health insurance rebate - please check with your health insurance provider).